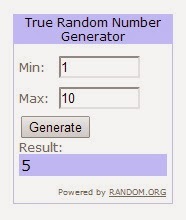 I used random.org to pick the winner of the giveaway..
Well done Jenny. Its funny isnt it Clair, I dont have anyone leave comments on mine now. Not that I add to it very often, haha maybe thats why. Although its linked to Facebook and I get comments there instead.